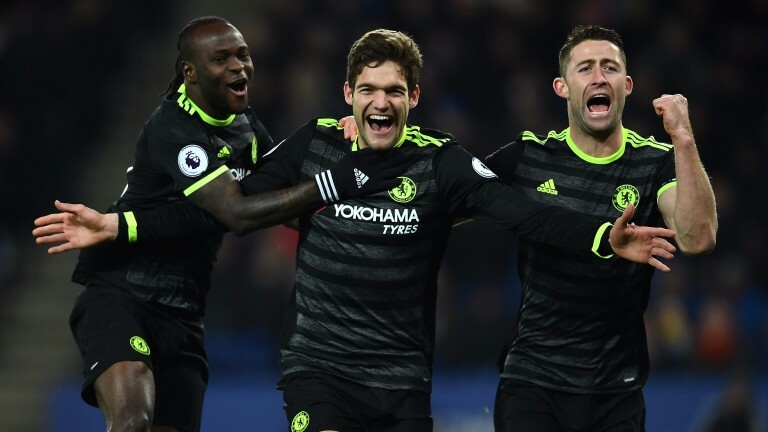 Chelsea have come through one of their toughest weeks of the season with a nine-point lead and could end up winning the title race at a canter. Perhaps the only remaining question over the Blues was their ability to deal with the biggest games. They had lost to Liverpool, Arsenal and Tottenham earlier in the season and, had they also been beaten by the Reds and the Gunners, there would have been genuine hope for the chasing pack. But Chelsea asserted their authority with a couple of excellent performances and would have taken six points had Diego Costa not missed a penalty at Anfield. Despite that setback Chelsea have added a point to their lead and have probably knocked Liverpool and Arsenal out of the race. Tottenham and Manchester City look the only possible challengers but both have little room for error and are likely to be distracted by European commitments. Chelsea have only the Premier League and the FA Cup to contest and it looks a matter of time before they regain the crown they won in 2015. There has been talk of a six-team scrap for survival after a week which has seen the gap between 15th and 20th reduced to two points but that may be wide of the mark because 14th-placed Bournemouth look vulnerable after their 6-3 stuffing at Everton. The Cherries played some good football at Goodison and won the shot count 18 to 15 but their defence was horribly exposed. Poor defending has been an ongoing theme for Eddie Howe’s side, who have shipped at least two goals in 13 of their last 16 matches. They were ruthlessly punished by a superb performance from Romelu Lukaku and will be up against plenty more top strikers in the weeks ahead. Six of Bournemouth’s next nine games are against teams in the top eight and a poor run could see them dragged into serious trouble. Watford were being touted as relegation candidates at the start of last week but have climbed into the top half after 2-1 wins at Arsenal and at home to Burnley. Staying up remains their top priority but Walter Mazzarri’s team are equipped to do better than merely survive and are value 10-3 shots to finish in the top ten. With Troy Deeney and Odion Ighalo failing to hit the heights of last season, Watford looked like they had a major problem. But Deeney has rediscovered his goalscoring touch, netting in each of the last three Premier League games, and has some top quality back-up with Milan loanee M’Baye Niang contributing a goal and an assist against Burnley. Mauro Zarate also impressed on his Hornets debut and Watford’s revamped attack could do more damage yet. Southampton’s strong point for most of the season has been their defence but they have conceded ten goals in their last three matches and can no longer be relied upon to keep things tight. The centre-back partnership of Jose Fonte and Virgil Van Dijk was key but it was broken up in January with Fonte joining West Ham and Van Dijk sustaining a long-term ankle injury. Replacements Maya Yoshida and Jack Stephens have struggled and it could be a bumpy ride for Saints, who have lost six of their last seven league fixtures. Anthony Grant has stood out as one of the better midfield players in Sky Bet League One and he will be sorely missed by Port Vale, who sold him to Peterborough on transfer deadline day. With Grant in the team Vale have won eight, drawn six and lost six of 20 league games. Without him they have won none, drawn two and lost six times.